Greetings, Shredderz! For those of you unfamiliar with Sagas of Shred, it is a weekly series — every Thursday night, California time — that features a new vintage surf ad. Well, I guess the ads are technically old, but you catch my drift. Today’s post actually features an ad that you can already find online. I first saw this vintage Wave Tools Surfboards ad on Board Collector. I decided to re-scan the ad and upload a higher quality image because it’s a real doozy. As you can see in the image, the ad features Lance Collins, founder and head shaper of the Wave Tools brand, and then team riders Jeff Parker, Preston Murray and Steve Richardson. The Wave Tools Surfboads ad originally ran in the August 1980 issue of Surfer Magazine (Vol. 21, No. 8). I was surprised to see the date on this ad, as it originally ran a few years earlier than I would have guessed. Traditionally Surfer Magazine’s dates are a bit ahead, meaning that the August 1980 issue was likely sold sometime around May or June 1980. In turn I would guess the team photo was taken in early 1980 at the absolute latest. You’ll notice that four out of the five boards featured in the Wave Tools ads are twin fins, and the jury is out on the one on the far right. I’d be willing to bet it’s a twinny as well, but unfortunately the deck is facing up. Well, I shouldn’t say unfortunately, because we’re treated to a shot of the amazing flouro gradient spray / checkerboard combo, which was an Echo Beach staple during the Eighties. Murray’s board — second from right, with the brick motif — is also a doozy. I’m not sure what the brick wall signifies, but you can also see it in the background of the ad itself. I also really dig the stripes on the twin fin to the far left. While everyone equates the Eighties with thrusters, it’s fascinating to see an ad that pre-dates Simon Anderson’s invention, during the last days of the twin fin’s dominance. As always, thanks for taking the time to reach this post, and we’ll have even more Sagas of Shred for you next Thursday night! Oh baby, this thing is clean! The seller claims the board is completely original and unrestored. I don’t know what to make of the price. It’s listed for $3,600, and I simply don’t have enough context on these older Hobies to make any sort of assessment. I want to say it’s expensive relative to other vintage Hobies, but again, not my area of expertise. This board isn’t nearly as tidy as the example above, but it has more than enough character to make up for it. You gotta respect any board with a checkerboard design on the deck. There’s also a certain degree of swagger that goes into that enormous Wave Tools logo on the bottom. I dig it all! The board isn’t cheap — it’s listed for $875, and I’m curious if it will get that price, given that it needs some repairs still — but it’s bitchin’ nonetheless. Never seen a Hobie Gary Propper Model with this kind of stringer setup before. 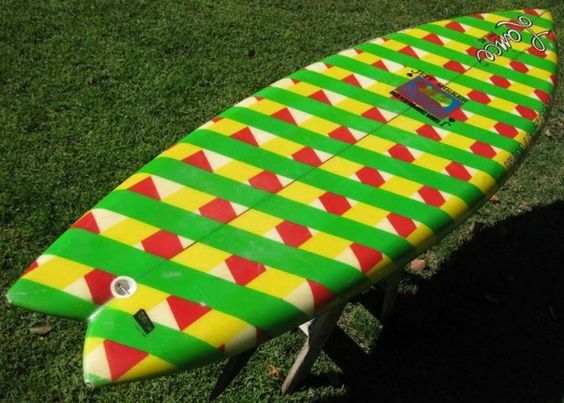 This board also sports the infamous Hobie bolt through fin, and even comes with the original one, too. It looks like most of the board, outside of the nose, has extra layers of Volan glass, but I’m not 100% certain. I’m a sucker for Con Surfboards, especially their older logs. The board above looks like it’s in pretty stellar condition. Once again, the catch is the price. The seller is asking $2,500, which I think is a bit on the high end. That said, the seller claims it’s all original and has never been restored, and it’s not every day you encounter a fifty five year old surfboard in such great condition.